Thank you and congratulations on your purchase of the The Omega Concern's HK 416 D10RS Assault Rifle. This rifle is designed to allow the user to use it in a combat or role-play setting, and is designed for seamless compatibility with the Omega Combat System, the premier combat simulation system in Second Life. If you are experiencing issues with the HUD not appearing to have all of the buttons it should, you can fix it by following the instructions in this article. This rifle can be abused and used to annoy and harass others. Don't do that. By purchasing and using it, you agree to use it with willing and consenting participants. No other application is intended or endorsed. 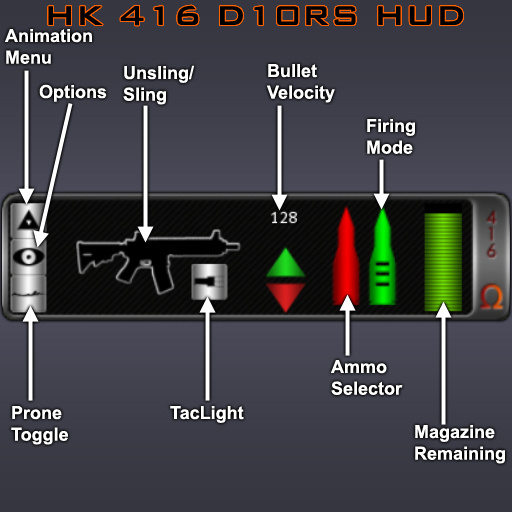 HUD HK 416 D10RS: By default, this Heads Up Display attaches to the center screen point, but it may be attached anywhere on the screen. Slung HK 416 D10RS: By default, attaches to your spine attachment point and appears on your back. May be moved to any other point you wish, but keep in mind the sling and unsling animations expect it to be somewhere on your back. HK 416 D10RS: This attaches to your right hand attachment point, and may only be attached there because the animations work with the assumption that it is there. Yes, you wear all three parts, which may be done easily by right-clicking the HK 416 folder in your inventory and selecting "Add to Outfit." Alternatively, "Replace Outfit" will work, but bear in mind you will only be wearing the 416 after that operation. The rifle is primarily controlled from the HUD. The HUD will attach to the bottom left of your screen. It may be attached to any point on your screen, and when the frame is clicked, will expand or collapse to display options or get out of your way. The HUD will recall where you moved it in both the maximized and minimized positions. This allows for some flexibility in how and where the HUD display appears. Your support passphrase is "Lead for Brunch." Sling/Unsling: This takes the rifle from its slung position on your back and places it into your hands. Bullet Velocity: Allows you to choose the velocity of the bullets. As a general rule, if you are firing at close targets, a lower velocity will work better than a high one. Firing Mode: Selects semi-automatic, three-round burst and full auto fire modes. Magazine Remaining: Graphic representation of how many bullets are left in the magazine. The 416 has a 30 round magazine, after which it needs to be reloaded. Ammo Selector: Clicking this will bring up the ammunition menu where you can pick the ammo you wish to fire. Prone Toggle: While the rifle is unslung and in your hands, this toggles your pose between standing and prone. If your prone position buries you in the ground, or makes you float above it, see the "Animation Menu" below.
? In OCS mode, prone can also be toggled with the "C" or Page Down key. The "E" or Page Up key will also bring you back to a standing position from prone. While in OCS mode, you will find your movement while prone to be limited, with a forward or backward tap of the direction keys only moving you a short way. This is intentional. Options: This brings up the options menu, where you can choose to suppress shell and magazine ejection. Go prone on a flat area. Press "Prone +" or "Prone -" until you are happy with where your avatar appears. Stand up again. You're done. The animation menu also allows you to stop or restart the shuffling of the holding poses, allowing you to hold your favorite pose, or resume the default operation which is to shuffle through the available standing poses.
? In OCS mode, the selection of ammunition is limited to a pre-selected list of OCS-compatible ammunition. As a general rule, all bullets described as "physical" may be stopped by shields or deflected by interceptors. Push ammunition will work only in non-push-restricted areas.
? OCS 416: OCS compatible bullet with a mean damage of 70 points.
? OCS TRC 416: Same as above, but as a tracer. DMG 416: Standard type physical combat damage bullet, effective only in damage-enabled combat areas. DMG-TRC 416: Same as above, but as a tracer. PSH 416: Physical bullet type which delivers a strong push in the direction of travel to avatars or objects with which it comes into contact. PSH-TRC 416: Same as above, but as a tracer. NP DMG: A non-physical shield-breaking bullet which delivers 100% damage to an avatar in damage-enabled combat areas. NP PSH: A non-physical shield-breaking bullet which delivers a strong push in the direction of travel to avatars. NP PSHO: A non-physical shield-breaking bullet which delivers a strong push in the direction of travel to physical objects. DESTAB: A non-physical, shield bypassing bullet with a Destabil payload which will remove unseated avatars from even push-restricted sims. Completely fatal in combat areas. If used on your own land, will unsit seated avatars before striking, rendering a target completely vulnerable. Included in the rifle kit is a set of gestures bound to F-keys. These gestures simply send the given command to the rifle on channel 24, so you don't have to click the buttons on the HUD itself. You DO need to keep the HUD on, however, as it is what parses the commands as they come in. Also, you may say commands directly on channel 24, for example typing "/24 unsling" would unsling the rifle, if it was slung at the time. Q: Will the HK 416 work with my Roleplay Combat System? A: They may. To date, we have not heard of any systems that the HK 416 will not work with. However, The Omega Concern does not guarentee compatibility with any other system but OCS and the Second Life Damage model. Q: Why do I seem to miss with my HK 416 in OCS? Because of how Second Life handles animations, some AOs may interfere with the animations done by your OCS gear. AOs also frequently interfere with mouselook aiming, making a weapon appear to not shoot where one is aiming. It is suggested that you shut off any AOs while using OCS gear. In short, this rifle is meant to deliver devastating fun, and work as a strong statement of your excellent taste for wielding a quality Omega Concern product. The Omega Concern promises to support your 416 for the lifetime of the product, with free upgrades for all of version 1.x, and lifetime bug fixes. The HK416 is an assault rifle designed and manufactured by Heckler & Koch to be an improved version of the M4 carbine pattern firearm. It is available as a complete firearm, or as an upper receiver kit that fits on any AR15 type lower receiver. The project was originally called the HKM4, but this was changed in response to a trademark infringement suit filed by Colt Defense. It could be speculated that '416' is a reference to the M4 and M16 it's designed to compete with. The HK416 piston system is similar to that found in the HK G36 replacing the direct impingement gas system used by the standard M16/M4. So far the weapon has reportedly been tested by the United States military as well as some law enforcement agencies. It is only available to government and military organizations. Which uses a piston driving an operating rod to control the function of the bolt, preventing propellant gases and the associated carbon fouling from entering the weapon’s interior. This increases the reliability of the weapon and extends the interval between stoppages. It also reduces operator cleaning time, heat transfer to the bolt and bolt carrier, and wear and tear on critical components. Allows all current accessories, sights, lights, and aimers used on M4/M16-type weapons to be fitted to the HK416. This HK rail system can be installed and removed without tools. Provides superior accuracy for greater than 20,000 rounds with minimal degradation of accuracy and muzzle velocity. Also due to the cold hammer forging process you get improved reliability, service life, and operator safety during obstructed bore occurrences or after extreme extended firing sessions. Some HK416 variants also have "OTB" (Over-the-beach) capability and can be safely fired after being submerged in water and not completely drained.